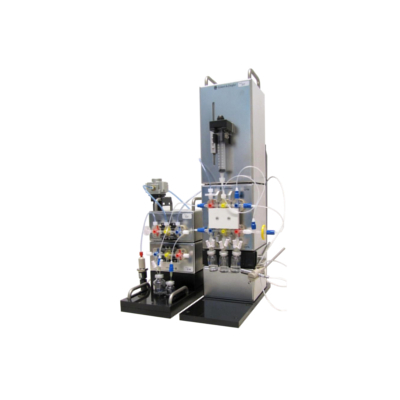 Based on the Modular-Lab PharmTracer technology for cassette-based production of a variety of tracers without cross-contamination, this specific setup can be used for vial dispensing of up to six vials. An additional vial is used for quality control. 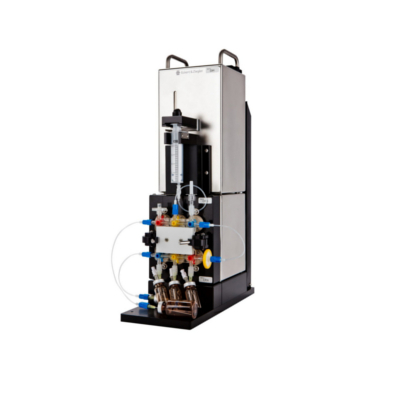 All versions of the Modular-Lab Dispensing unit are customized to the customers needs. With the Modular-Lab PharmTracer dispensing system the dosing of the product aseptically into vials in a Class C/ Class 10,000 environment can be also done now with a closed and sterile fluid path provided by the dispensing cassettes. The dispenser is available as a ‘stand-alone’ device. As an add-on, modules or the dispensing cassettes can be mounted into any Modular-Lab PharmTracer synthesis system and make it useable as a dispenser. The dispenser consists of the Syringe Module (SYM), a 2-fold Modular-Lab PharmTracer Module (SLM-2) (add-on system) and a control unit and PC (for ‘stand-alone’ device). For extension of dispensing from 4 into 6 vials an additional module SLM-1 can be added. With one extra SLM-1 module the system can be extended to perform an automated cassette pressure and sterile filter integrity test. Dilution of the activity and measurement of volume of active solution can be done. With a small activity detector – that can be freely placed – and with a Detector Shielding Module (DSM) the activity of the stock solution is measured, a defined volume removed and measured again to give the input for the volume calculation. The detector has a wide range of measurement and can be calibrated for a defined isotope and setup. The cassettes are assembled under GMP-compliant clean room conditions, sterilized with gamma-radiation and double vacuum-packed. All consumables used are chemical resistant and have been tested for their suitability with the specific syntheses. All materials are free of animal derived ingredients. A shelf life of 18 months can be guaranteed. Due to the cassettes one-time use no cleaning, drying or sanitation routines are necessary. Cassettes for dispensing have a complete closed fluid path. All components as vials, sterile filters, spikes, etc. are included and only one connection to the stock vial or the synthesizer has to be done. Our dispensing cassettes can also be manufactured in small batches according to our user requirements (specific vials, filter, etc. ).